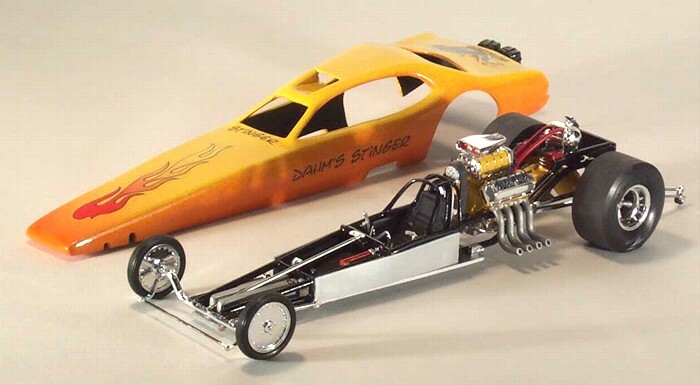 This project was inspired by the winner of Car Model Magazine's 1968 National Funny Car Contest, Jim Keeler's "Dodge Fever". The "Dodge Fever" model is displayed at the International Model Museum and can be seen on the Museum's website. Jim Keeler's futuristic 1968 design still looks great 30 years later, and its still one of my favorite models. 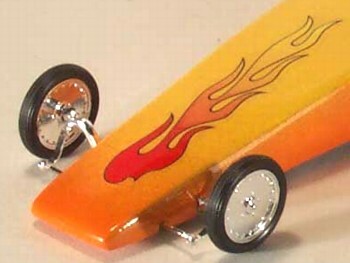 I finally got around to building my own version in 2003, "Dahm's Stinger". The "Stinger" body is made from 2 AMT 1971 Dusters and the main chassis components are from Monograms Stinger. 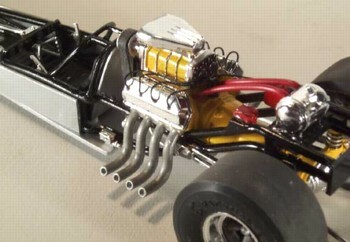 Many of the chassis detail parts including the dual parachutes are from a Revell Fuel Dragster kit. 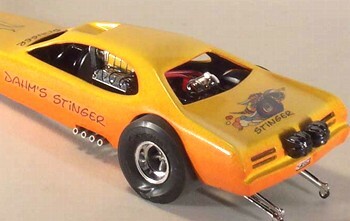 The "Stinger Bee" decal on the rear is from a MPC Dodge Charger kit from the '60s. First I put together the chassis so that I could custom fit the body to it. The Stinger chassis is mostly stock with a few modifications. 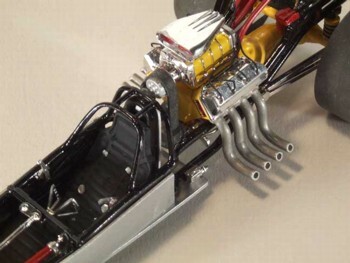 A Revell dragster kit supplied, the fuel tank, fire extinguisher, gas pedal, brake pedal, oil pump with lines, oil filter, steering wheel, and the drivers roll cage. The Moon tank is from the parts box. The rear axle was narrowed 1/4". The front engine mount was attached below the frame tube to lower the engine. Sheet plastic was used to add protective panels on the sides and back of the driver cockpit. The frame rails were painted gloss black, the engine and rear end gloss yellow and the flat panels Testors Metallic Silver. The body is made from 2 Duster bodies. Duster body #1 was cut off, in about the center of the driver's compartment. Duster body #2 was cut off 3/8" further back than the cut just made on body #1. Next the back of body #1 was attached to the front of body #2 with Zap-A-Gap glue. This makes the new driver's compartment for the new Duster/Stinger body 3/8" longer than stock. One of the hoods was then attached in place on the new body. About 3/8" was cut off the front of the Stinger body, so that the front area is flat. A hood was also attached to the front of body #1. About 2 1/2" was then cut from the front of body #1, and attached to the front of the new Stinger body. This made the Duster/Stinger body about 9 3/4" long. A straight line was then marked on each side of the body, from 1/4" down from the front fenders to the front bottom edge of the rear wheel wells. The marked line was then cut creating the wedge shape for the sides. A rear bumper was dechromed and attached in place. The wedge shape for the top of the body was done by marking a triangular shape with the point at the rear/center of the Stinger body, and the base of the triangle on the front edge, about 1/2" in from each side. The triangular shape was then cut out of the top of the body. The rear of the body was cut in the middle following the point of the triangle down through the bumper, and the front was cut down to 1" wide following the line set by the base of the triangle. The 2 outside body sections were then sanded smooth by, holding 1 side at a time and sliding it back and forth on a sheet of 100 grit sandpaper, on a flat surface. The body sides were then attached with Zap-A-Gap glue. Pieces of sheet plastic was used to reinforce each glue joint. The bottom of the new body was then leveled out on a sheet of 100 grit sandpaper. By the way I use a Dremel tool with a "cut-off wheel" for most of my rough body cuts. Its fast and easy, but be sure to wear eye protection because these "cut-off wheels" do break sometimes when you are cutting. I chopped the top about 1/4" at the front, and then cut the top across just in front of the rear window, leaving the rear at stock height. Strip plastic was used for the new windshield posts. The front wheel wells were filled with sheet plastic. A small front roll pan was made with sheet plastic and the gap was filled with strip plastic. Next I fit the new body to the chassis. The rear wheel wells were cut out to fit and then the body was cut out to clear the front axle and exhaust pipes. The roof scoop was cut out, and two triangular pieces of sheet plastic were cut to fit the inside scoop sides. These pieces were glued in place and then the base of the scoop was cut out and glued in place. The body was then rough sanded with a sanding board and filled with putty inside and out. The body was then sanded and primed. The body was primed with Krylon White Primer, then sprayed with Krylon Yellow and fogged with Krylon Orange. The body was the sprayed with Testors Glosscote. 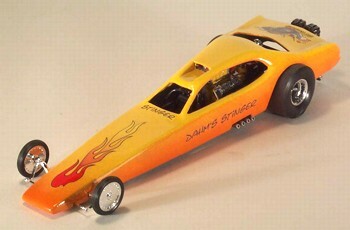 The "Dahm's Stinger" stickers were made on the computer and the flame sticker is from Autographics. It took me quite a while to get around to building "Dahm's Stinger", a tribute to the original "Dodge Fever", but I'm glad I finally did. It looks good in the showcase and it reminds me of a great design from the past.